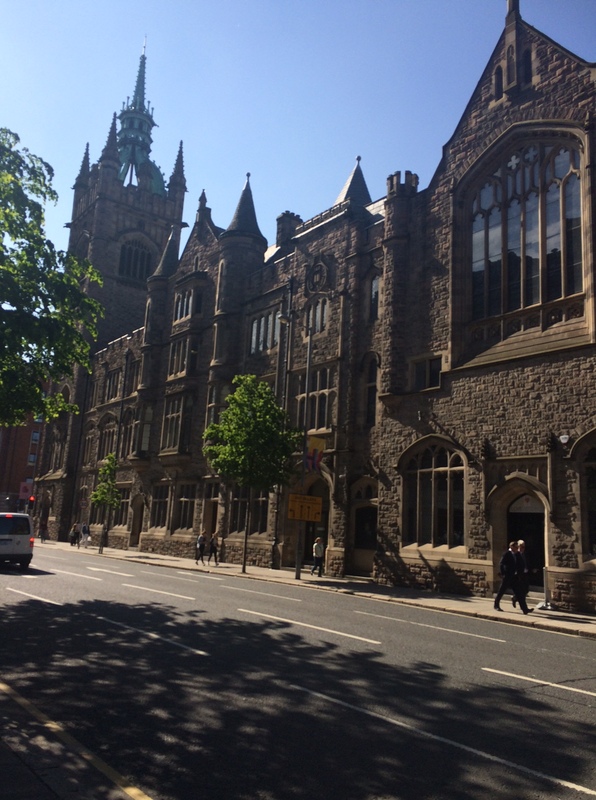 I just spent a few days in Belfast, Northern Ireland and I loved it — friendly people, wonderful architecture, good food and, of course, pubs. But first, a reminder that Northern Ireland is a part of Britain and the Republic of Ireland to the south is an independent nation. 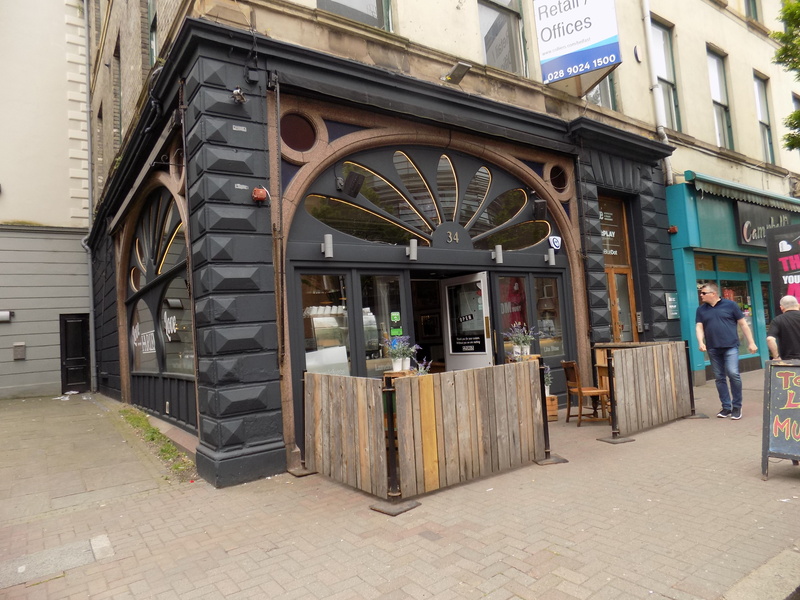 This is relevant to the fact that twenty years ago, visitors to Belfast were the same kind of people who today would visit Damascus…..
Harlem Cafe, good breakfast spot and good music in the evenings. Between 1968 and 1997, Belfast was the site of more terrorism than perhaps any single place on earth. In a civil war called “The Troubles,” the Loyalists (or Unionists) and the Republicans (or Nationalists) fought each other in the streets of the city. The Loyalists are mainly Protestants who support Northern Ireland’s membership in the United Kingdom. The Republicans are mainly Catholics who want Northern Ireland to become a part of the Republic of Ireland. The Catholics believe they are treated like second class citizens in Northern Ireland. Their army was the IRA and their politicians belonged to Sein Fein. The IRA received weapons from such diverse sources as Libyan strongman, Momar Qaddafi, and the United States government. The Loyalists had plenty of help from the British military. Today, there remains tension between the two sides in Belfast but, thanks in large part to the peace-making efforts of President Bill Clinton, the terrorism is over. 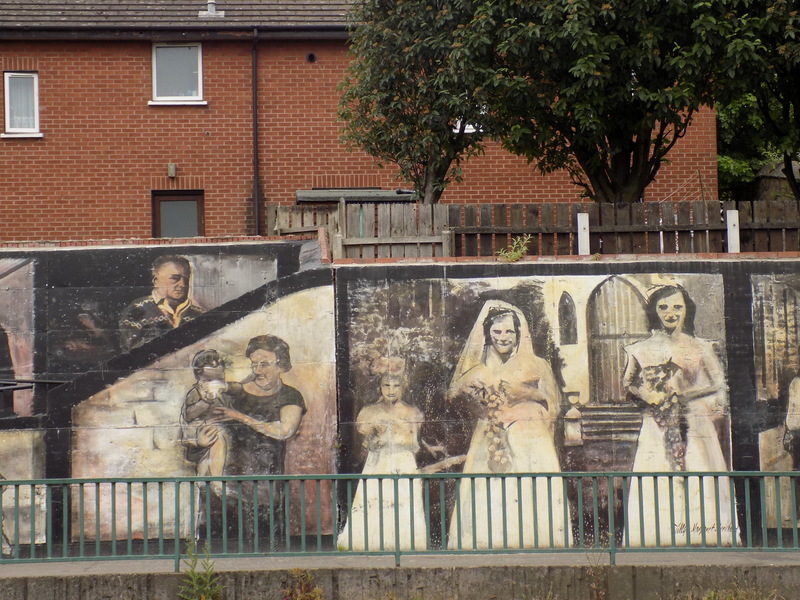 The story of the city’s conflict is commemorated with amazing murals all over town. 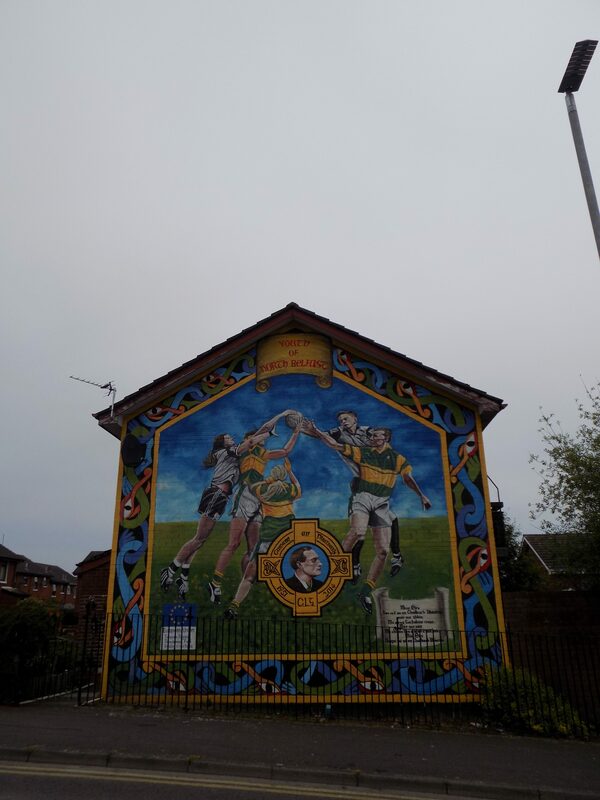 To learn more, I toured the murals with local tour guide, Gerry, in his classic black cab. 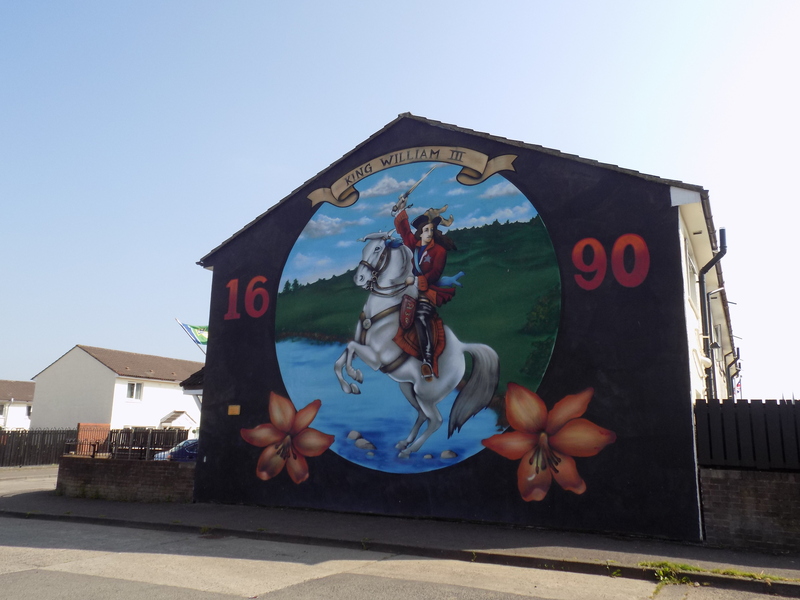 For Gerry, Belfast’s history is a story in which the Loyalists were almost always wrong and the Republicans were almost always victims or poetic heroes, probably both. This made me uncomfortable even though I am sympathetic to the Republicans. When I returned to my wonderful hotel, the Fitzwilliam, the concierge filled in some of the gaps in the story. Thank you Philip! Here are some photos of the murals and historic sites. 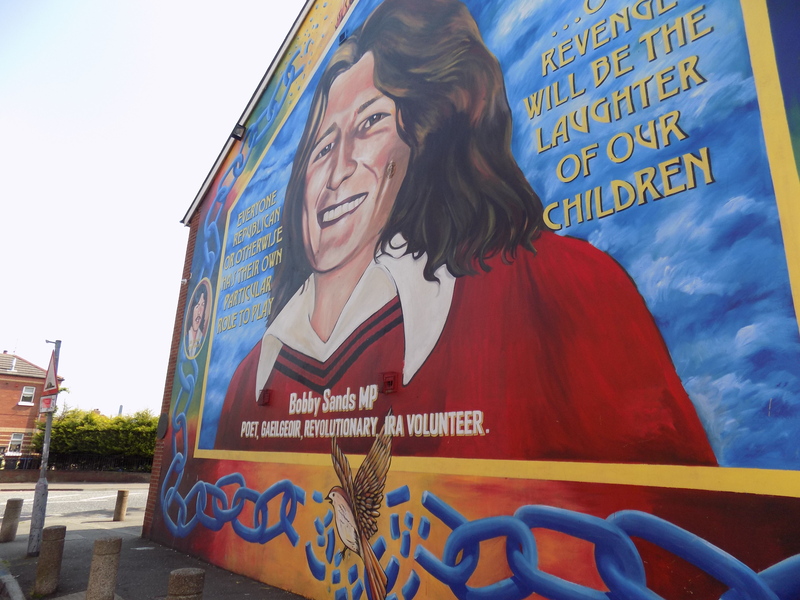 Bobby Sands, IRA volunteer who was voted into Parliament from his jail cell. He died there on the 66th day of his hunger strike. The darling of the Loyalists, William of Orange, who stormed the Irish Coast to keep Britain Protestant. Long story but you recall that Henry VIII originally made England protestant because the Pope wouldn’t let him get divorces. 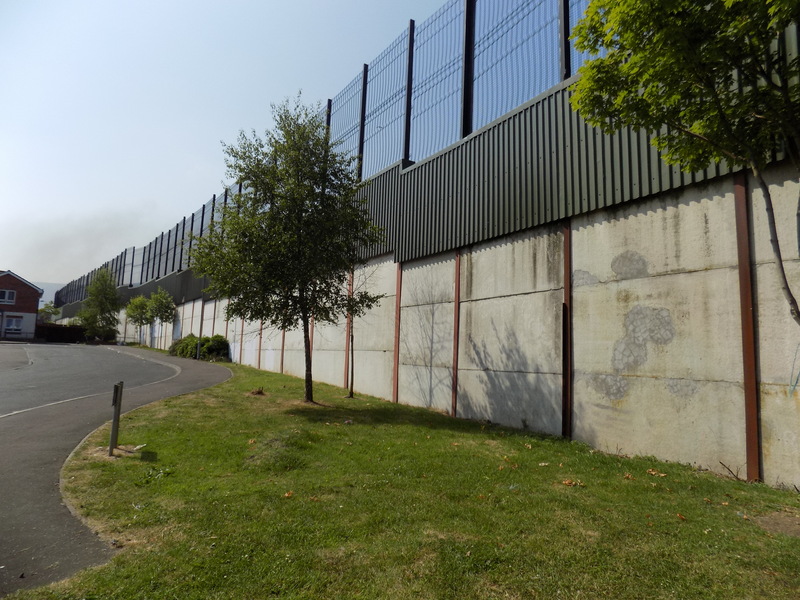 One of the ironically named “Peace Walls,” which divide Belfast’s Protestant neighborhoods from its Catholic neighborhoods. 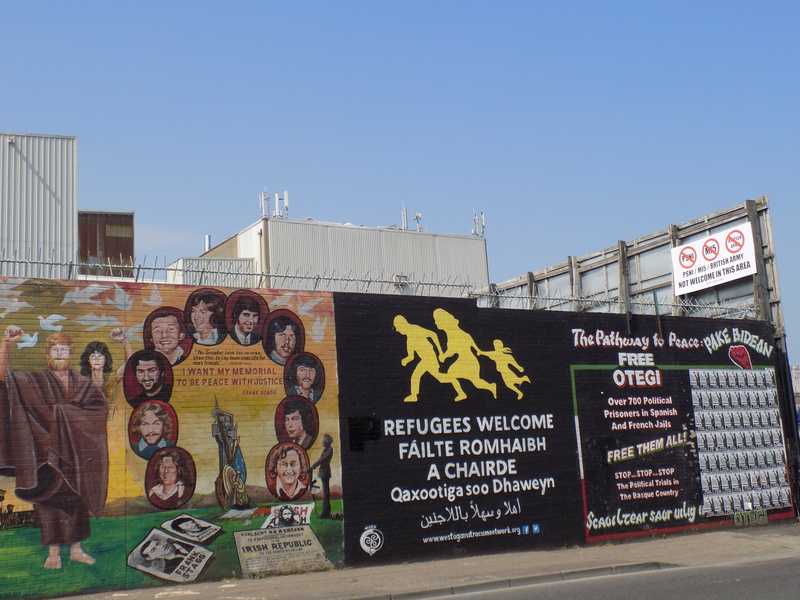 Belfast’s Catholics support the refugees from the Middle East and Africa. I found this on my own — I think it commemorates local football hero George Best. Commemorating the riots and deaths in 1969, which are considered the birth of 30 years of violence. Belfast is also the site of the construction of the Titanic. 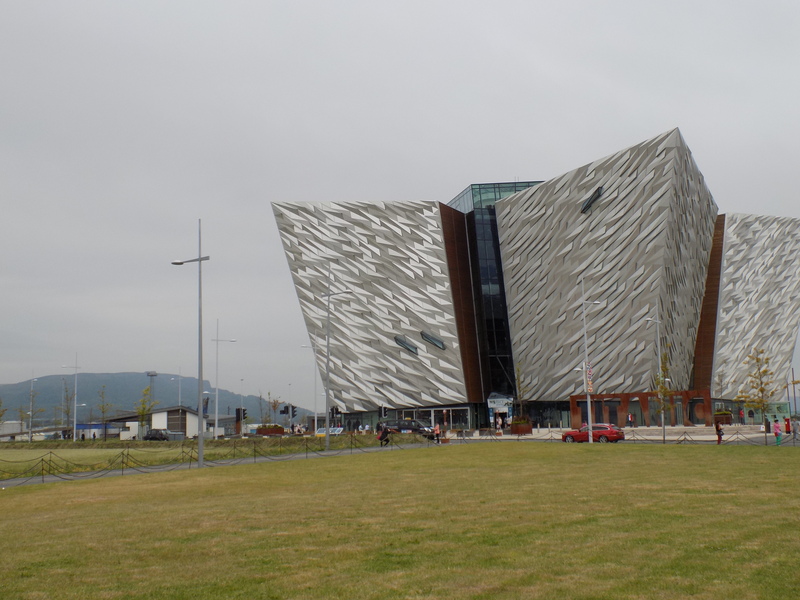 Belfast’s new Titanic Museum presents the story in three floors of high tech exhibits that are so noisy and visually demanding that I don’t remember much. I think what I mainly learned at the museum is that to process and synthesize information, you need to have a moment to think. 🙂 The building is designed to evoke the feeling of the ice berg that sunk the ship, which is quite clever. 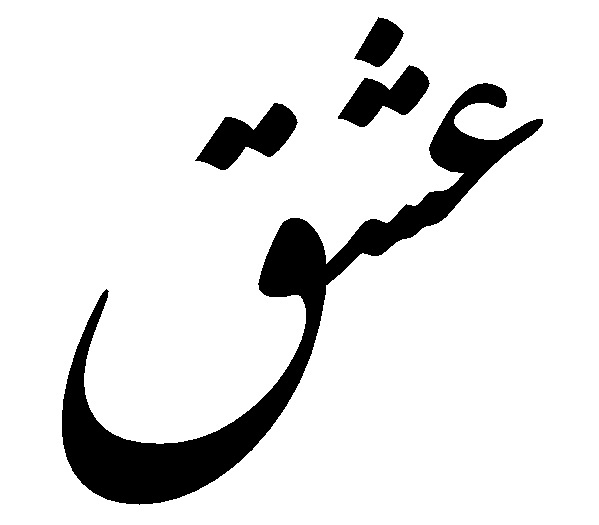 Happy first day of Ramadan. 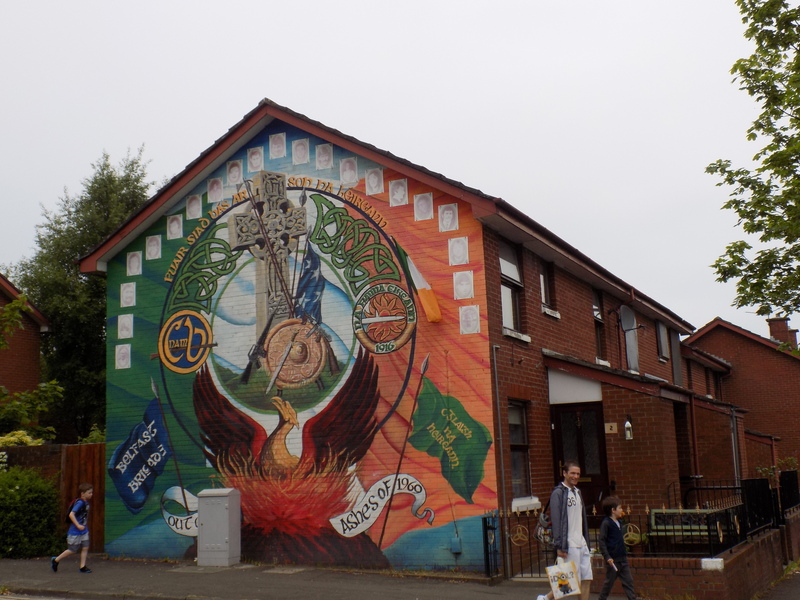 The Troubles are still very much a part of the Irish consciousness, both in the north and south. I’ve found it literally impossible to find a citizen of the Emerald Isle with a “balanced” perspective. It’s the heroes vs. villains version of history which I heard at every turn from every side during my visits there. Maybe that’s a lasting legacy of civil wars, including our own. However ours has the almost unique distinction of being one of the few conflicts which overcame the truism that “history is written by the victors”. The “Lost Cause” myth pervades popular histories of the American Civil War which it is still referred to by addled folks in many places as the War Against Northern Aggression while denying slavery’s central role in causing the conflict. Yes. Good catch. Will fix that ! Very interesting – thanks. Wonderful pics! Looking forward to your impressions of other parts of Ireland! I just love Ireland! Fascinating, Kim! I didn’t know there were still walls separating the Catholics and Protestants. Wow.